Every week I feature a profile of a classic car owner. This past year I interviewed several for a publication called Indiana Autos and RVs. It’s been fun talking with classic car owners, especially when they are already my friend. John and his wife Carol attend my church. John Schreiber restored a 1958 Chevy Bel Air. It was an oddball year. 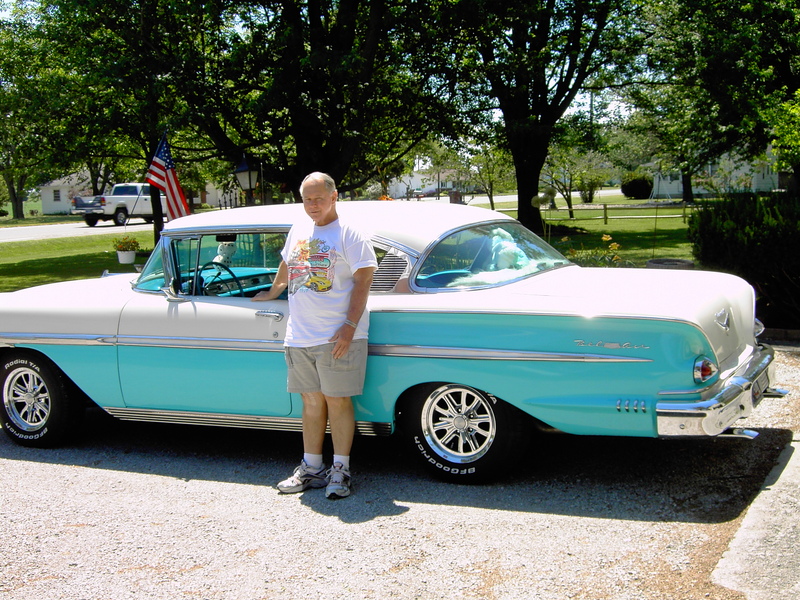 Schreiber, a retired employee from General Electric in Fort Wayne, owns a 2-door, hard-top 1958 Chevy Bel Air. The car was heavily optioned from the factory. “It was equipped with a 348 engine, power windows, power steering, power brakes, and air conditioning,” Schreiber said. When Schreiber bought the car, it needed restoration. He could choose to keep it ‘stock’, i.e. using parts as the car was issued by the factory. Car owners go this route if they want to compete in judging at car shows. At the time of purchase Schreiber performed the mechanical work, using a lift in his pole barn to work on the car. He installed new springs, shock absorbers, and transmission. He also replaced disc brakes, tires and spoke rims. He paid others to do the interior work. Schreiber has won several trophies at car shows, including Best of Show. Schreiber estimates he drives his car 3,000 miles a year to car shows at the Bluffton Free Street Fair, James Dean Festival in Fairmount, Blueberry Festival in Plymouth, New Haven Canal Days, Berne Swiss Days, and Fort Wayne’s Muddy River Run. He and his wife Carol also attend monthly cruise-in’s in Fort Wayne. The couple belongs to a car club called “Fort Wayne Rolling Classics”. “Although the club members are mostly owners of cars from the 1950s and 1960s, any type of car owner is welcome to join the club,” said John Schreiber.